You don’t fall in love with sushi at an all-you-can-eat Chinese buffet. Sadly, however, it’s often the first spot many Americans encounter the wacky idea of eating raw fish on a pile of rice. And no wonder people run screaming from those dried up, horrifying, evil little bits of nastiness. That’s like comparing Little Caesar’s to a fresh wood-fired pizza made with 00 flour, fresh mozzarella and basil by a trained pizzaolo. No contest, because when you start with the bad stuff, there’s little impetus to actually try the good stuff. Strawberry Hill Boone’s Farm ain’t prepping you for the wonders of a single vineyard Flowers chardonnay. What’s tragic is that a buttery piece of fiercely fresh tuna belly or fresh salmon handled by a trained sushi chef can be an absolute game changer. It’s also very rare and worth seeking out. We’ve found just that at Sake 107 in Petaluma. 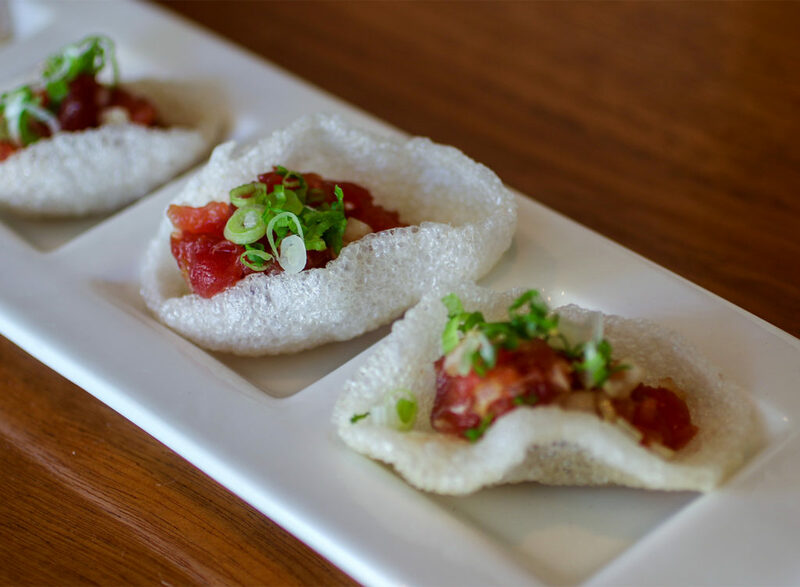 Open nearly a year, the buzz has steadily grown for Chef Eiji Ando, a Hana Japanese alum who has dedicated his life to the craft. 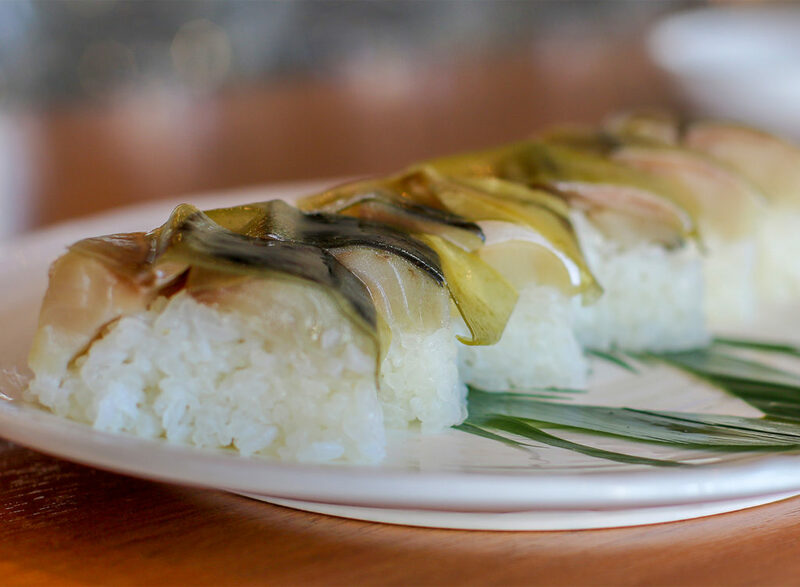 It’s awe-inspiring to watch the flicking of his hands as he shapes the seasoned rice and fish into a single perfect bite, and perfect isn’t a word we use lightly when it comes to nigiri. God help you if you are gauche enough to dunk it in soy sauce. Ando watches me instinctively pour soy sauce into a dish, saying everything by saying nothing. “No soy sauce?” I ask a bit sheepishly. Honestly, I’m a dunker, because I eat a lot of cheap sushi. “No soy sauce,” he says, gingerly brushing on a special concoction of soy, sake and rice vinegar atop the fish. No bright pink ginger. No wasabi (they actually have real wasabi should you request it). 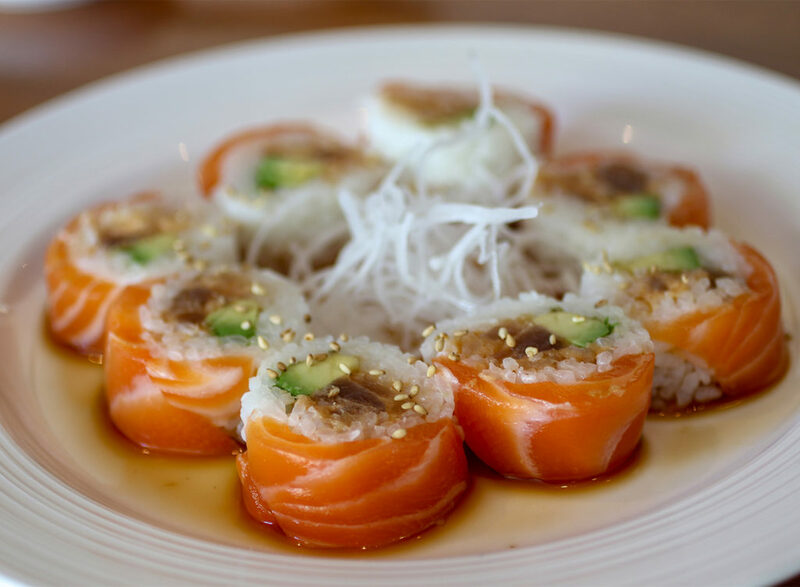 The umi masu (bright orange ocean trout from Scotland) is a single perfect bite because of what it isn’t — it isn’t fishy or vinegary; it isn’t overly chewy or drowned in salty soy sauce. The rice is precisely seasoned, without too much or too little, blending into the background rather than sucker-punching you in the tastebuds. Instead, this bite of nigiri is a cloud of umami covered in an unctuous ocean breeze, assuming that were even possible, but frankly it should be. No soy sauce is lesson one. Hatcho miso is lesson two. Made in Ando’s home prefecture of Aichi (smack dab in the middle of Japan), hatcho miso is a dark fermented paste made only with soybeans. Aged two summers and two winters under literal tons of rocks, its used as a base for soup as well as sauces. Unlike more familiar miso, hatcho has been made at just two factories in Aichi the same way for 650 years, using 200-year old casks and a whole lot of manpower. It adds a slightly bitter, salty flavor to foods that is unlike other more nuanced miso. Ando’s signature Miso Katsu and Asari-hatcho miso soup are both stellar representations, and it’s a flavor you won’t soon forget. The third lesson: Sake shouldn’t set your throat on fire. We’ve had some really cheap sake and some of the world’s most expensive sake, and the good stuff is worth the price. 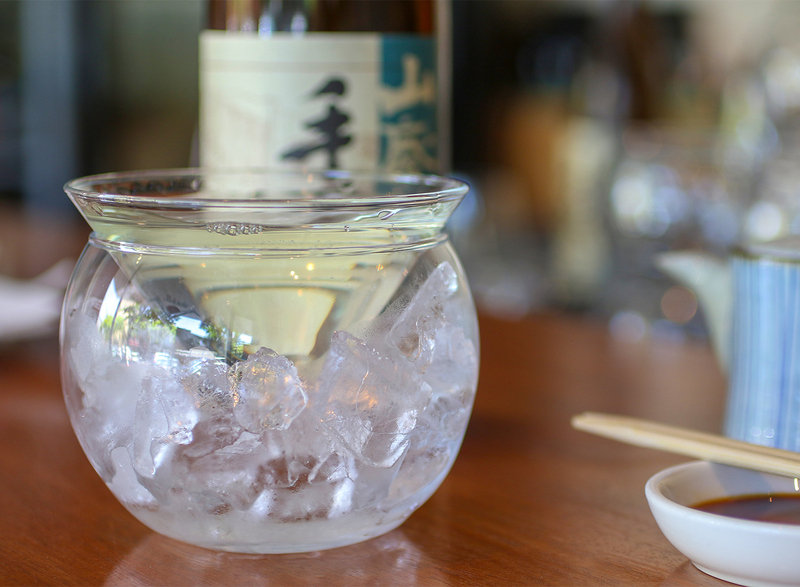 At $12 per glass, Tedorigawa Yamahai Junmai is a softly assertive representation that will have you rethinking why you never got more into sake. With a simple menu focused on fresh fish and produce, along with family and vegetable-foods (shrimp tempura, agedashi tofu, chicken teriyaki, garlic eggplant), Sake 107 doesn’t take itself too seriously. But don’t let Ando’s easy manner fool you, because he’s a real-deal chef who knows his way around a piece of fish — raw or otherwise. 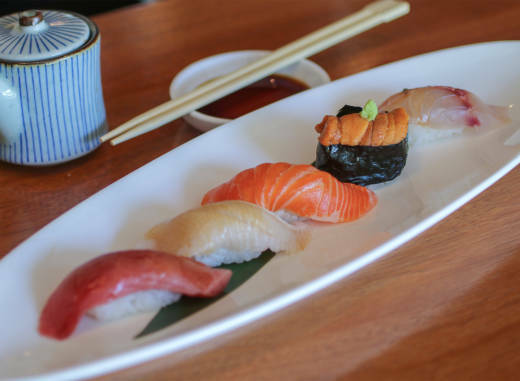 Five Piece Nigiri, $21: Put yourself in the chef’s hands. Personally, we wish we’d doubled or tripled that. 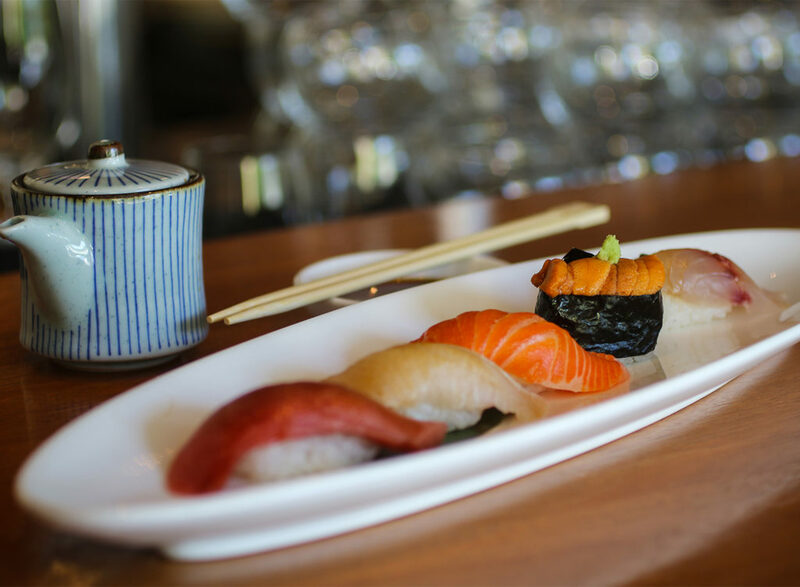 There’s not a stinker in the bunch, but don’t miss the Hokkaido uni, ocean trout (umi masu), sake (salmon) or maguro (big eye tuna). We want so badly to love saba — a marinated and pressed mackerel — but its a strong flavor that takes some getting used to. If you’re into it, Ando has a special off-menu roll he’ll make for you. Hamachi Umeshiso Age, $12: A small plate with a sort of yellow tail, pickled plum and shiso sandwich fried in tempura batter. 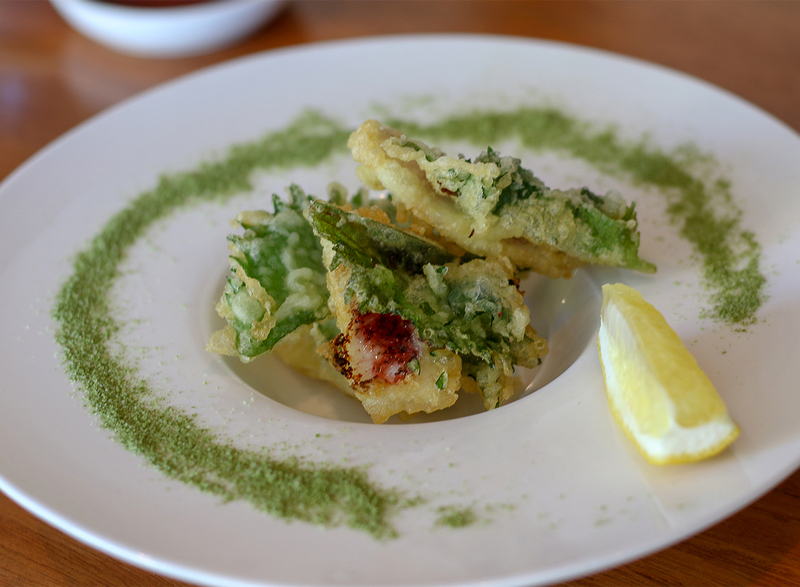 The combo of light fishiness, sour plum and astringent shiso wrapped in crunchy batter is a home run. 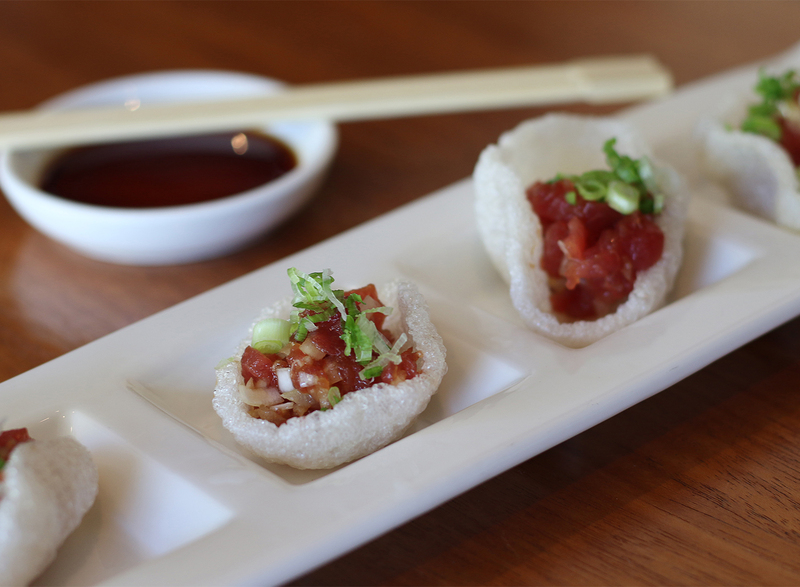 Tuna Lily, $13: A little gimmicky, but a stunning plate of ruby tuna tartare cupped in puffed shrimp crackers. Miso Katsu, $20: A signature dish and personal favorite of Ando, this is serious comfort food. 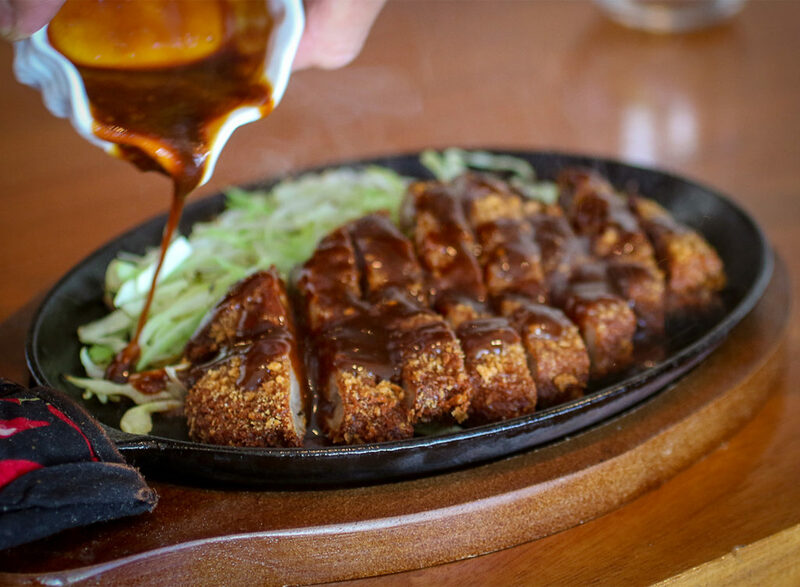 Kurobuta pork is fried in panko and thinly sliced, with a hatcho miso sauce poured atop the pork, creating a fragrant steam that will have you trying to eat the super hot pork way before its ready for your craw. I have the blisters to prove it (but worth it). Melts in your mouth roll, $17: Sushi rolls and I don’t get along. I generally find them horrifying, filled with fried nastiness, covered in bad rice and doused with four kinds of sauce. This isn’t that. Daring Ando to overcome that kind of distaste, he threw out a signature roll made with spicy tuna and salmon sitting on a pool of homemade ponzu sauce. I’m still not a spicy tuna fan, but the roll had me at homemade ponzu. This citrusy soy sauce makes what could be cloyingly rich into something with depth and character. Overall: Seriously awesome sushi and izayaki in downtown Petaluma that reminds us of what great Japanese food can really taste like.